Annoyed that the Mac’s Preview app, and not Adobe Reader, always gets to open your PDF files, or that Safari has dibs on your HTML documents rather than your favorite text editor? Well, one way to open your documents with the programs you want is to right-click the file in question and select “Open with…” from the pop-up menu. But there’s also a way to permanently change the “default” program that opens a given type of document. 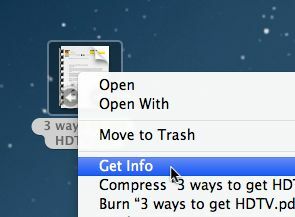 Right-click a file and select “Get Info” to pick a new default program for the document. Let’s say you want Adobe Reader, and not Preview, to open your PDF files. The first step is to right-click a PDF on your desktop (any PDF will do) and select “Get Info” from the pop-up menu. When you do, a lengthy pane of information about the file will appear on your desktop. In the middle of the information pane, you’ll find a section titled “Open with”—and there, you’ll see a pull-down menu with the current default program for PDFs (Preview, in this example) selected. Click the menu, then select Adobe Reader. 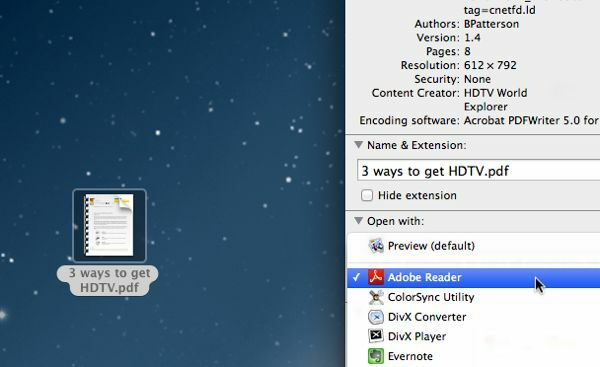 Keep in mind that Adobe Reader, or whatever program you want as the default choice for PDFs, must be installed on your Mac for it to appear in the menu. At this point, you’ve only designated Adobe Reader to be the default program for the single PDF file you’ve been tinkering with. To make Reader the default for all PDFs on your Mac, click the “Change All” button. Finally, click the “Continue” button on the “Are you sure…?” confirmation prompt. That’s it! You should now see that the folder icons for all your PDF files have switched from Preview to Adobe Reader—and when you double-click your next PDF, it will open in Reader by default.